Meyer Werft of Papenburg, Germany, pulled off a coup on Friday with the announcement of an order for the first of a pair of large cruise ships for Royal Caribbean. Apart from a raft of five ships for Celebrity, this is the third pair to be ordered at Meyer Werft recently, following two ships for Disney Cruise Lines and more recently, another pair for Norwegian Cruise Line. Project Sunshine is the name Royal Caribbean has given to this next generation of ships, the first of which will be delivered in the autumn of 2014 and the new ship will be the fifteenth ship to be built for Royal Caribbean Cruise Lines by Meyer Werft. The yard has built ten ships for Celebrity Cruises, starting with its first newbuilding, the Horizon, in 1990, plus the four Brilliance class ships for Royal Caribbean International. Richard Fain, chairman and ceo of Royal Caribbean Cruises Ltd, in announcing the letter of intent, stated that "Royal Caribbean has worked hard to earn a reputation of offering the most innovative ships in the cruise industry and this next generation will not disappoint. While we continue our policy of keeping our newest ideas and features under wraps during the early stages of construction, I can say that I am very excited about the passion and imagination that our teams have devoted to the project. Project Sunshine builds on the best ideas of our existing ships and adds exciting new activities and entertainment concepts. It will offer features for everyone: from grand, spectacular spaces to small intimate settings; from active, invigorating activities to the serenity of more personal space; and from a plethora of dining alternatives to a cornucopia of opportunities for families. I am also excited about the energy efficiency and environmental technologies which have been incorporated. 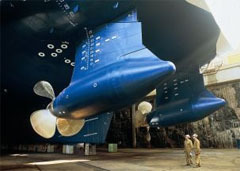 Our existing ships are some of the most energy efficient in the world and Project Sunshine takes this one further step. Based on our over 20 years of experience with Meyer Werft, along with their compelling proposal, we know they will deliver on all of the innovations Royal Caribbean's guests have come to expect." Of the ships previously on order for Royal Caribbean, the Celebrity Silhouette is to be delivered later this year and Celebrity Reflection in 2012. Meanwhile, Meyer Werft has just delivered the first of another pair for Disney, with the Disney Dream now in service, and Disney Fantasy to follow in 2012. This latest announcement leaves Korean-owned STX out in the cold. For now, having lost these latest orders to the competition, it has only three new ships on order, the MSC Divina for MSC Cruises, Phoenicia for GNMTC of Libya and Hapag-Lloyd Cruises' Europe 2, just announced. STX's large cruise ship shipyards in both Finland and France now seem to be genuinely short of possible places to obtain new orders. Fincantieri, meanwhile, continues to thrive on orders from Carnival Corp & PLC, from Carnival Cruise Lines, Costa Crociere and Princess Cruises. And to the chagrin of STX, even Meyer Werft has a steady supply of Carnival Corp orders, for its German-based Aida brand.